Friday, April 13, 2018 ~ 2:00 p.m.
Thursday, April 12, 2018 ~ 5:00 – 7:00 p.m.
Velma L. Webb, 85 of Ashland, NE passed away Saturday, April 7, 2018 at Ashland Care Center in Ashland. She was born January 17, 1933 in South Bend, NE to Rolland C. and Lillie B. (Ward) Cox. She was a graduate of Ashland High School. Velma was united in marriage to Elmer Hofmeister on June 23, 1951 in Saunders County. In 1956 Elmer was involved in a fatal automobile accident. In 1958 Velma married Roy “Dean” Webb in Mississippi. Velma worked as a cook and waitress for Frosty Treat, Gateway Inn and Linoma Beach. She was a member of American Legion Post #129 Auxiliary. Velma enjoyed collecting salt shakers, reading, especially westerns and romance novels, and going to the casino. 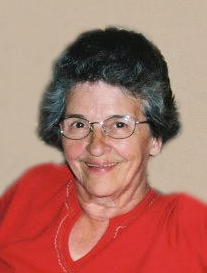 She is survived by her children, Bryce Hofmeister of Ashland, David (Laurie) Hofmeister of Ashland, Clint Hofmeister of Ashland, Jackie Newman of Houston, TX, Pat Webb of Ashland; 8 grandchildren and 11 great-grandchildren; siblings, Rolland Cox, Shirley Groenjes, Marilyn Deal, Erma Pharaoh, Bill Cox, Jerry Cox, Lila Biernet, Stacy Cox, Allen Cox. She was preceded in death by her husbands, Elmer Hofmeister and Roy “Dean” Webb; parents, Rolland & Lillie Cox; brothers, Floyd and Jim Cox. A great lady. She will me missed by all who knew her.